A health savings account, or HSA, can help offset the costs of a high-deductible health plan. An HSA is a savings account you can use to cover qualified medical expenses such as deductibles and prescriptions. It allows you to choose your own doctors and shop around for the best deal on services and procedures. Contributions made via direct deposit from your employer are taxed, which lowers the amount of tax you pay. Contributions made with after-tax dollars can be deducted from your gross income on your tax return. Any funds you don't use will roll over to the next year. There are no “use it or lose it” rules. Automate contributions with direct deposit or automatic transfer. Covers medical expenses for your immediate family. Use the funds in your HSA for qualifying medical expenses for you, your spouse and any other dependents, even if they are not covered under your health plan. You can access your funds in many ways. Pay for medical expenses by writing a check, using your free HSA check card, via online bill pay, or by coming to any Ascend branch. Should I choose an HSA or a Traditional Health Plan? How do I reach my HSA savings goal? Feeling overwhelmed? Take a minute to learn more. 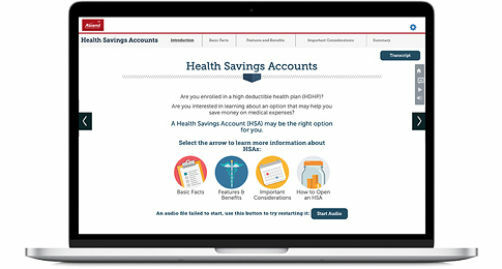 Visit our free interactive online financial education center for videos and lessons about HSAs. You'll be an expert in no time at all. If you work for a company that offers a high deductible health plan, a health savings account (HSA) could be right for you. We will be glad to discuss the benefits of our HSA with you. Please call 800-342-3086 and ask to speak with an IRA/Certificate Support Representative. Any eligible individual may establish an HSA. Eligibility is determined on a monthly basis. To be eligible, an individual must meet all of the following requirements: Covered under a high deductible health plan (HDHP) on the first day of the month; generally not covered by any health plan that is not an HDHP (exceptions exist for coverage that is not part of an HDHP for accidents, disability, dental care, vision care, long-term care, or permitted insurance); not enrolled in Medicare; and not able to be claimed as a dependent on another person’s tax return. The owner of an HSA is called the "HSA owner." Note: Permitted insurance is insurance under which substantially all of the coverage provided relates to liabilities incurred under workers’ compensation laws, tort liabilities, liabilities relating to ownership or use of property (e.g., automobile insurance), insurance for a specified disease, or illness and insurance that provides a fixed payment for hospitalization. Which medical expenses qualify to be paid for by my health savings account? Qualified medical expenses are expenses incurred after an HSA has been established, are not covered by insurance, and are paid by the HSA owner, his or her spouse, or dependents. Types of qualified medical expenses include: diagnosis, cure, mitigation, treatment or prevention of disease, or for the purpose of affecting any structure or function on the body; transportation for the essential medical care listed above; qualified long-term care services; premiums for qualified long-term care insurance, COBRA health care continuation coverage, health care coverage while an individual is receiving unemployment compensation; for individuals over age 65, premiums for Medicare Part A or B, Medicare HMO, and the employee share of premiums for employer-sponsored health insurance, including premiums for employer-sponsored retiree health insurance; and certain amounts paid for lodging while away from home that is essential to medical care. How do I pay for qualified medical expenses? Qualified medical expenses can be paid by using your HSA debit card, using your HSA checks, signing an HSA withdrawal form or accessing your HSA via online banking and transferring the funds to your designated account. Can I use my HSA for a family member? Yes, distributions from HSAs for qualified medical expenses of the HSA owner, his or her spouse, or dependents are exempt from federal income tax and penalties. These are considered qualified distributions. Non-qualified distributions are distributions that are not used for qualified medical expenses are includable in the individual’s gross income. In addition, non-qualified distributions are subject to a 20 percent additional penalty tax, unless the distribution is made after the HSA owner’s death, disability, or attainment of age 65. Note: HSA owners are responsible for making the determination as to whether an HSA distribution is qualified or non-qualified. The HSA owner should maintain records of his or her medical expenses sufficient to show that the distributions have been made exclusively to pay for qualified medical expenses, and are, therefore, excludable from gross income. HSA trustees or custodians, as well as employers who make contributions to an employee’s HSA, are not responsible for determining whether distributions are qualified or non-qualified. There are two different ways to open an HSA. Click below to begin the process of opening an account via our HSA Service Center. To open an account by phone, call 800-342-3086. 61. For information on your specific tax situation, please consult a tax professional.